An Objectivist Individualist: ObamaCare Premium Changes Vary Hugely by State - How Does this Affect Control of Senate? ObamaCare Premium Changes Vary Hugely by State - How Does this Affect Control of Senate? The Manhattan Institute for Policy Research has an interactive map of the US with the percentage change in health insurance premiums by gender and for ages 27, 40, and 64 years of age. It is remarkable how much variance there is in health insurance costs by state, by gender, and by age. 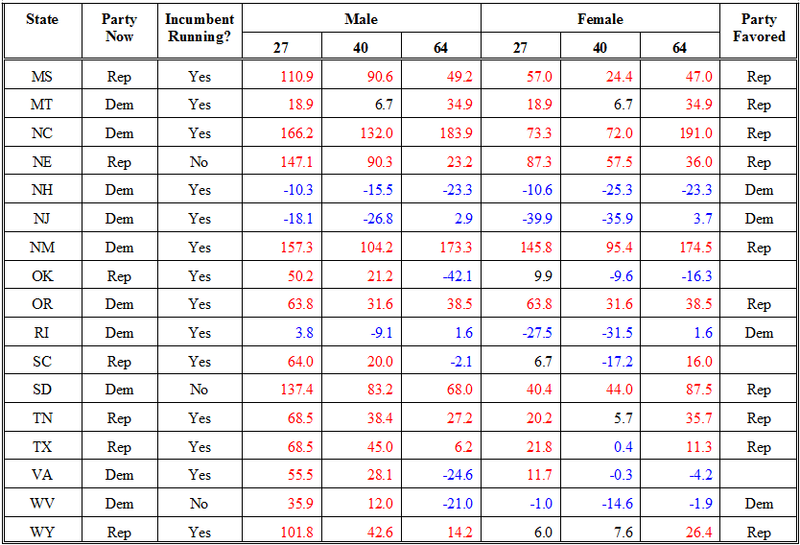 The differences with respect to gender and age are clearly on very different bases from state to state. In a few states, the rates actually fall. In most states they increase substantially. Sometimes they rise greatly for one demographic, while falling for another in the same state. In some states the large increases are only for young men, in others for both young men and women, while in still others they rise most for young men and for older women. The campaigns for the Senate need to be aware of where their candidate has advantages or disadvantages with various demographics due to the health insurance premium changes. 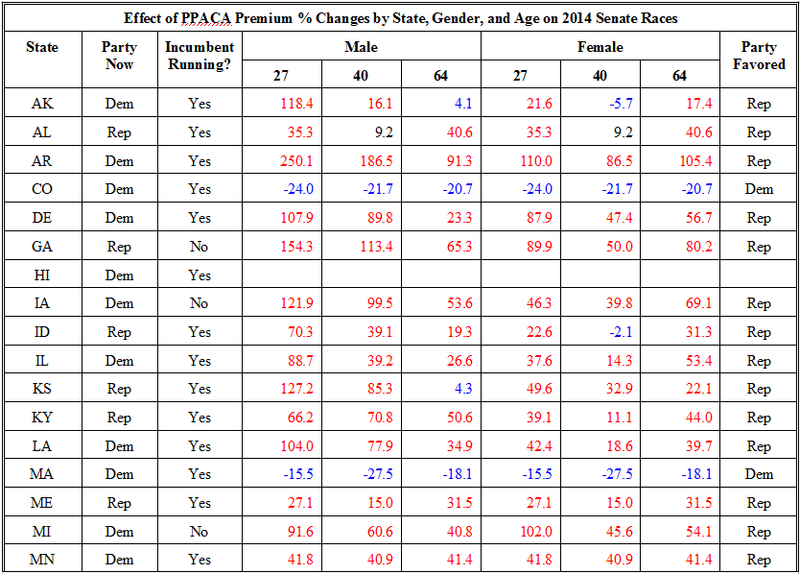 I have prepared a table with the Senate races of 2014 and the ObamaCare health insurance premium changes below. Those increases which exceed 10.0% should allow Republicans to pick up votes, provided their campaigns make sure that the demographic suffering those large increases know what is hitting them. Males 27 years old in Arkansas, where Democrat Mark Pryor is vulnerable, are facing premium increases of 250.1%, while women of that age will see increases of 110.0%. Men aged 40 will pay 186.5% more, while women aged 64 will pay 105.4% more. With increases as large as these, it is very hard to imagine that an informed electorate will view the Democrat Pryor as less than a monster. But this message has to be driven home by Tom Cotton. There are very big increases in many states, which the Republican candidate should take great care to inform the voters about. All increases greater than 10% are in red in the table since they favor the Republicans. Those of 5% or less are in blue since they favor the Democrats. The party favored is not a prediction of the election outcome. It is only to indicate which party has the advantage based on the ObamaCare premium changes. Of course other factors are also significant, but the Republicans in many cases should and must make a big deal out of the increases in many of the contested states if they are to take over control of the Senate. The now Democrat Senate seats in Alaska, Arkansas, Iowa, Louisiana, Montana, North Carolina, and South Dakota all have very large ObamaCare premium increases which a decent Republican candidate should be able to use to win those 7 Senate seats. In Kentucky the increases are also large, which should protect the Republican Senate seat there. Very large increases in Michigan, Minnesota, New Mexico, and Oregon should make it possible for a wily Republican candidate to become competitive even in those states where the Senate seat is now a Democrat seat. Even in those states with no overall advantage to one party, a successful effort to inform a demographic hurt by premium cost increases will be a useful tool for a Republican candidate.